8oz. Square White Coffee Mug 8ct. 8oz. Square Ivory / Bone Coffee Mug 8ct. 8oz. Square Black Coffee Mug 8ct. Ivory / Gold Masterpiece 8 oz. Plastic Coffee Mug 8ct. Silver Splendor 8oz. White Plastic Coffee Mugs w/ Silver Band 12ct. 2 oz. Yoshi Square Miniature Espresso Mug 12 ct. Tiny Tempations 2.7 oz. Tiny Tonics 8 ct.
8.5 oz. Square Bottom Plastic Coffee Mugs 8ct. 8 oz. 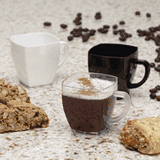 Clear Plastic Flared Square Coffee Cups 8ct.